Update 4.09: Tournaments and more! Warzone has just been updated to version 4.09.0! This update overhauls and adds a lot to tournaments, as well as brings a bunch of new features. This blog post describes what’s changed. This update is particularly noteworthy, as it’s the first time since the Warzone launch that I’ve been able to focus on adding features to the game again. Expect more features in the future! This update is live now on the website at https://www.warzone.com. The Android app will receive this version in the next day or two, and the iOS app will receive this version in the next week or so. The iOS and Android app now support tournaments! Tournaments were previously a website-only feature. The app can do everything the website can, such as joining/declining tournaments, viewing the bracket, chatting, viewing players, etc. Also noteworthy are that team tournaments in the app are much easier to view, as the teammates are listed directly on the bracket instead of requiring a click to see. 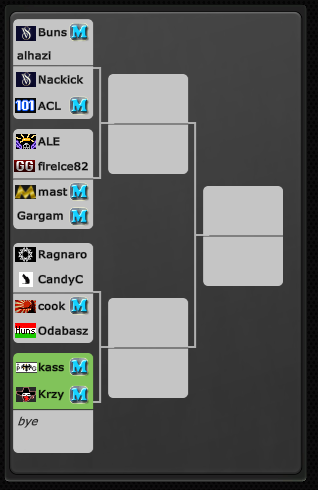 Further, in large tournament brackets it’s much easier to find yourself or players with the new “find” button that highlights all of their games and allows cycling through them. Adding tournaments to the app will increase tournament use a lot, as the majority of Warzone players play through the app and never had access to tournaments before. Tournaments now support byes! This drastically increases the flexibility of tournaments, as it means it’s no longer required for the number of players to exactly match the tournament size. Previously, starting a 128 player tournament required that exactly 128 players join. Now, the tournament can start with any number, as long as at least one game can be created. Multi-day tournaments will start in one of three ways: When it fills up (as normal), when the tournament creator clicks the new “Start Tournament” button listed on the tournament page, or when it reaches a specified time limit as defined by the tournament creator. Real-time tournaments will always start when they reach their start time as defined by the tournament creator. The 30-minute delay that existed before was removed. Real-time tournaments will always start exactly on time. Byes are awarded randomly to participants. If a team tournament attempts to start with unfilled teams, those teams will be merged automatically. The most recently created open tournament is now advertised on the multi-player dashboard again, as well as in the Unity app under your games. This helps increase the visibility of open tournaments. The UI for creating tournaments has been re-written from scratch! It’s now much easier to use and more intuitive. The tournament prize system has been simplified and had its flexibility increased. When creating a public tournament, creators can now specify any entry fee from 0 to 2000. Creators can also add extra coins to the prize. Members can now create one multi-player free mod game per week that allows non-members to join! Previously, this was only allowed one time, and then cost 3 coins per player. Now, this can be done every week. This resets every Sunday. As always, single-player modded games are always free for members in unlimited quantity, as are multi-player games with other members. When viewing history, the date/time of the turn is now displayed below the turn number in the upper left corner. 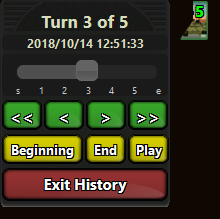 This makes it easier to see when a turn happened, which was previously only available on hover. In Local Deployment, when a bonus is fully deployed to, it will disappear from the tooltip in the top left. This makes it much easier to see what’s left to deploy when you’re playing on large maps. – All: Fixed a bug with the army cap that made your displayed income in the lower right corner show incorrectly. Thanks to Master Farah for reporting this. – Unity: Updated Unity to 2017.4.12f1. – Unity/UJS: Fixed a bug that made the AI pick very slow on some very large maps. Thanks to TerribleHerbst for reporting this. – Unity/UJS: The Autopilot button is now present in the menu for non-members, and explains what it is when clicked. – Unity/UJS: Non-members will sometimes get a free autopilot trial when playing single-player. – Unity/UJS: Non-members that click the “Change Mods” button now get more info about what mods are. – Unity/UJS: Fixed a bug that made your level and member icon not show up next to your name in single-player. – Unity/UJS: Fixed the double-tap-to-attack feature of the attack/transfer dialog so that if your finger happens to be over the Cancel button as the second tap is clicked, it will now be considered a double-tap instead of a cancel-tap. – Unity/UJS: Increased size of army box in the attack/transfer dialog slightly. – Unity/UJS: The deployment slider will now pop to the left of the cursor when opened near the right side of the screen. – UJS: Fixed bugs with the “C” hotkey toggling commander checkbox. Thanks to Muli for reporting this. – UJS: The red “close” button is more intelligent about sending you back to the page you came from. Thanks to GentlePurpleRain for reporting this. – Website: Changed the way redirects to the app work so that, if the app isn’t installed, you get a better error message than “cannot open”. – Website: The /Points page has been re-formatted to use bootstrap. – Website: The /Mobile page has been re-formatted to use bootstrap. It also now shows your platform on the top if visited from Android/iOS. – Website: Fixed the “Play” button on the home page when browsing from iOS / Android so it correctly directs you to install the mobile app. – Website: Fixed a bug when using unicode characters and double quotes that could cause output to be incorrect. Thanks to TBest for reporting this. Author FizzerPosted on October 14, 2018 3 Comments on Update 4.09: Tournaments and more!